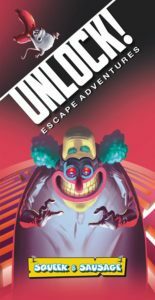 Concepts: Released in a single box here in the UK (sorry Americans), this set includes three escape room adventures. Designed for group play of 3-4 players, each of the three games packed within are presented via a set of cards. A digital mobile app is used to time the players and to provide clues. Writing: Each of the three adventures is written and illustrated by a different team of creative designers. The adventures are as follows. “The Formula” is the most straightforward and accessible of the adventures presented here, framing the players as government operatives that have been sent to recover a secret formula from a scientist’s subterranean laboratory. This is a well-written adventure which occasionally hints at governmental conspiracies; our game ended with the players coming to the opinion that the scientist in question had been involved with the US government’s Operation Paper-clip. “Squeek and Sausage” is a cartoonish misadventure that casts the players as heroes attempting to foil the plans of a sinister super-villain. 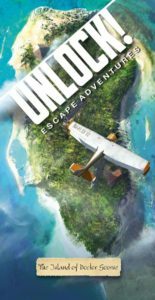 This adventure has a fantastic visual style and makes use of some excellent object puzzles, which brings back memories of classic point-and-click adventure games such as “Day of the Tentacle.” This particular adventure was the stand-out favorite of the box for us and is sure to be a hit for family groups. The final adventure, “The Island of Doctor Goorse” sees players are survivors of a plane crash on a deserted island filled with ancient relics and are tasked with piecing together blues as to how they may escape. Like with all of the adventures in this pack, the app doubles as a timer and provides background music; this time it feels especially atmospheric and this is by far the most thematic of the games in the pack. It is also the most densely puzzle-laden, with improbable situations that bring to mind the classic Tomb Raider games. Mechanics: The game operates primarily through cards, each of which have a number on their back and illustrations on their face. When the players enter an area, they turn over a card to represent that room – the illustration includes areas that can be explored by giving the number of other cards, thereby creating a map of a room. There are several types of cards that the players will discover. Object cards are simply that; cards that represent objects. Their corresponding number can be added to the number of other cards in order to represent using an object on a card – that is, you could use a key (card 12) to unlock a door (card 10) by turning over card 22. At other times, players may need to examine the illustrations in order to find hidden clues, or even perform short challenges on the mobile app in order to find the clues that they need. At other times, players will need to amass clues in order to determine a code; this code is then entered into the game’s accompanying mobile app in order to uncover how to proceed. Design: Overall the design for the game is good. The cards are sturdy and the app is easy to use, and does not ever feel too tacked on nor too much of a hinderer to gameplay. This is mostly because its main function is to keep track of the time limit – usually an hour. This does, however, bring us to a problem that we found when playing “The Island of Doctor Goorse”. The app is also able to give hints. During our gameplay we were having considerable difficulty in one puzzle. We eventually asked the app for a hint, only to find that we still had no idea what to do and so we asked it for a second. The second hint outright gave us the answer. This was a problem because in order to get that answer, we had to possess objects that we hadn’t yet obtained – and, in fact, could only be achieved by using two objects that we did already possess in a specific way, thereby forcing the entire adventure to skip past almost 20 minutes of play-time! This is not a flaw that’s specifically limited to this adventure, all of the other adventures in this pack will give the answer if you reach the end of the available hints, but both “The Operation” and “Squeek and Sausage” are more linear in nature. It is in the more open-ended structure of “The Island of Doctor Goorse”, and the app’s inability to measure how far the players have progressed, that this becomes a problem and hopefully future games will take this into account to prevent players from accidently bypassing whole swaths of the adventure. Playability: In general, the gameplay for these games was a lot of fun. In both “Squeek and Sausage” and “The Operation”, there are no challenges that not entirely reasonable and approachable. “Squeek and Sausage” uses a far more zany style of ‘moon logic’ than “The Operation”, but which is entirely in keeping with the mood of the adventure. “The Island of Doctor Goorse”, though, has a few issues, and not simply the one mentioned above. To start, it requires players to team up into equal groups, and starts the teams unable to communicate with each other – almost impossible to do when you’re seated around a table together, and certainly not the most pleasant experience if you are a couple and are now needing to split up for a game. It also makes it impossible to play with three players. This adventure also includes two puzzles that are especially difficult for people with certain disabilities; one which is a barrier for deaf players, and another which is a barrier to those who struggle with colour blindness. Players with the latter condition will struggle with many points in these games due to the presence of ‘hidden objects’ – often very small numbers which are secreted around illustrations, often only a slightly different shade of colour than their background. Sharp eyed players will have no issues finding them, but it does create a bit of an ableist hurdle for those who can’t and are thereby excluded from participating in that part of the adventure. Conclusion: On the strength of “Squeek and Sausage” alone, this is a solid product. Add in “The Operation” and you have enough adventures for a lot of fun. If you are able to overcome the problems that our group had when playing “The Island of Doctor Goorse”, then you may indeed find that to be an excellent adventure as well. 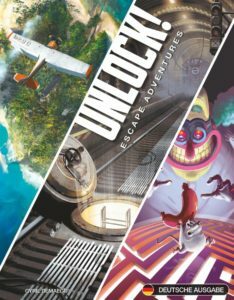 It should be noted that, as with most escape room games, these games are a one-play product. Once completed, they have almost no retail value. However no parts of them are destructible during gameplay, no parts of the cards or boxes need to be folded or torn or dented, meaning that there is nothing to stop you from selling the game on once completed. That is a bonus and we take that into account with this game’s score. FINAL THOUGHTS: A rather fun collection of enjoyable and atmospheric adventures. Although the quality of the three contained is variable, with the very best of them being absolutely fantastic. 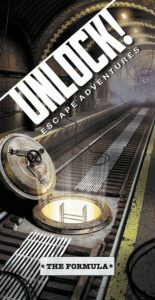 Great for fans of adventure games and lateral thinking puzzle enthusiasts. Tags: AsmodeeCard GameCooperativeDigital ApplicationEscape RoomPuzzle SolvingUnlock!